Figure 1: the main MMC interface. Drillfloor equipment controls and associated equipment on the latest generation of floating drilling vessels have evolved into a “system” of computer-controlled machines that are currently operated by multiple operators each running these machines from a series of dedicated control stations. The latest drilling vessels use as many as three operator stations to drill the well, trip tubulars or perform offline activities such as stand building. These stations individually control their respective machines but require constant “multitasking” operations by their operators, which results in inefficiency and operator fatigue. A multi-machine control (MMC) system for automatic control of the hoisting, rotating and pipehandling systems has been executed on a recently delivered sixth-generation semi. The MMC allows full automatic control of these systems from one operator using one joystick. This article will discuss the control system and machine hardware and software and how the development process has taken this technology from concept to a working drilling and tripping machine that adds value, efficiency and safety. The latest-generation drilling vessels are employing more and more computer-controlled tools on drill floor. By replacing roughnecks with machines in hazardous areas, safety is improved for the crew. The increased number of tools does have its price, however. Several multitasking operations are required by the operators, where fatigue and loss of concentration can lead to dangerous situations even though preventive safeguards are in place. Another issue introduced by the increasing number of machines is time consumption. This is especially noticeable considering that each pipe handshake takes time, with the operator having to switch between several machines. Figure 2: The Maersk Developer uses the MMC system for automatic control of the hoisting, rotating and pipehandling systems. MMC is a software tool designed to improve trip-in and trip-out operations, focusing mainly on safety and efficiency. There are other advantages, such as less wear and tear and more constant tripping speeds. By allowing the PLC to carry out pipe handshaking and controlling all the machines simultaneously, one operator can perform tripping faster and safer than what three operators could previously do. A fixed sequence is also more predictable, thus increasing safety on the drill floor. When drill crews are familiarized with the sequence, they will know what each machine will do next. In contrast, with several operators controlling different machines, there is an uncertainty as to how the machines will move next. Wear and tear on the machines is reduced because MMC operates each piece of equipment in an optimal manner. More constant and predictable speeds are achieved because MMC does not tire out, nor is it very susceptible to the variety of operator experience. As long as the operator is maintaining the speed, acknowledging certain stages in the tripping operation, MMC will handle pipe in the exact same way every time. Handing over pipe between two machines is where MMC has one of the biggest impacts on time savings. 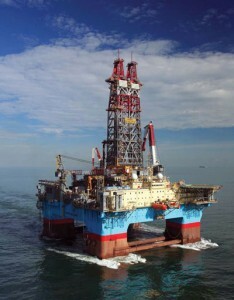 Several newer rig designs have moved setbacks off drill floor, effectively lowering upwards of 1,000 metric tons 20 m down. This increases both stability and variable deck load (VDL), but the consequence is the need for additional machines. Depending on how many additional machines are required and on layout, MMC will help to maintain a good tripping speed. Design of the MMC is based on a modular principle, allowing it to be applied to a variety of drillfloor designs. The speed, or time-saving factor, is determined by the number of machines, how fast each machine can do its part of the job and how fast interaction between them can be carried out. This article will look at the development of the system from concept to a fully working automated drill floor. It will look at the control system principle and both hardware and software design. 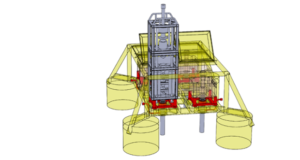 When performance is discussed, it will use a recently delivered sixth-generation semisubmersible, where the setback area has been moved off the drill floor, as an example. The paper will also look at how implementation and testing have been carried out in order to fine-tune the system for maximum performance. Figure 3: Layout of the pipehandling system on the Maersk Developer. • By optimizing machine interactions, i.e. pipe handshaking. The main design philosophy is based on a modular design using existing machine controls to achieve full automation. This will allow the system to be implemented on any drill floor. The first MMC system was implemented on a semisubmersible but can just as easily be implemented on drillships or jackups. Figure 3 shows the layout on the rig in question. During development of the MMC concept, two main designs were considered. These can roughly be described as either designing new control logic for all the machines working as one, or using existing and proven control logic to operate each machine. The second principle was chosen. The MMC controller does not contain any machine control logic. Instead, it is designed as a sequence controller, sending requests to the existing machine controllers telling them what to do, much like a human operator would. Feedback to the MMC controller is relayed from the individual machine controllers, omitting the need for new hardware in the field. With this design, each machine operates as it would if it weren’t in the MMC sequence. This means each machine can be taken out of sequence at any point and run in manual or semi-automatic mode. The added redundancy does require the capability to efficiently control all machines in manual or semi-automatic mode, which will require additional operators during these events. If an unforeseen event causes the sequence to stop or be halted, this capability can be used to rectify the problem. Without stopping the entire sequence, the problem can be solved and the sequence continued. Other attempts at creating fully automated drill floors have not had this feature, thus requiring the sequence to be completely restarted, which can take up to 10 minutes. To allow for flexibility in the system, certain features like spin in/out is made available from the MMC keypad controls at the appropriate steps in the sequence. These do not require the machine in question to be taken out of the sequence, minimizing the extra time spent if, for instance, a stand has not been completely spun in or out. Interaction between MMC and the operator is minimized to include only speed control and confirmations at critical stages in the trip in/out operations. All machine speeds are set prior to starting the sequence, with the exception of the V-door machine (VDM). This speed is controlled analogues by the operator because this machine is involved in many stages of the sequence where feedback cannot confirm the state of the overall system. Confirmations by the operator will typically include “pipe in box,” “break out/make up done” and fingerboard latches open/closed. These are places where there is only visual feedback from the system to acknowledge correct status. A primary design feature of the MMC is that it normally requires no additional hardware in the field. A PLC connected to same network as the other machine controllers is all that is required. If additional feedback, i.e. new hardware, is required, this is added to the machine controller in question. For software, the design is based on a modular principle. Each machine in the sequence is represented by a module (blocks of machine code), which in turn is divided into sequence controls for trip in and trip out, command mapping toward the actual machine controller and common controls for all the machines in the MMC setup. In addition, there is an overall control to monitor the sequence. This is used to select the appropriate camera for the CCTV system. It will also maintain the other features of the system, such as initialization, setup, operator messages and machine registration. MMC has several interface screens to provide the necessary interaction with the operator. 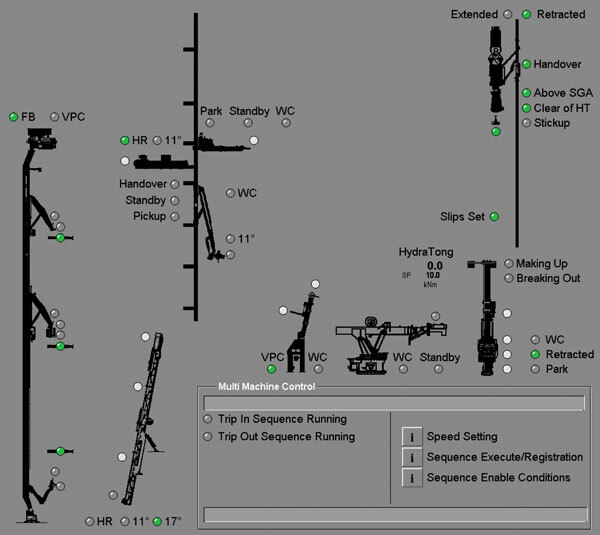 The main screen contains statuses for each machine, indicating open/closed status on grippers, etc, correct tilt positions and makeup torque (actual and set point). Operator text asking for confirmation and giving feedback is also shown here. Figure 1 shows this screen. There are three additional sub-menus: speed setting, where the speed for each machine is set; sequence registration, where machines are taken in or out of sequence; and enable conditions, which is a tool showing which machine is not ready to start the sequence and which statues are missing. The sub-menus are support windows used only when certain situations arise. With so many machines in motion at the same time, keeping an eye on everything at once can strain the operator. Several different CCTV sequences can be tied into the MMC, which will put the camera where focus is needed on the main screen. This will primarily be where the pipe handover is taking place. Auxiliary CCTV screens will usually have a four-in-one camera image covering everything happening in the setback area. The experience of the operator will affect MMC’s performance to a certain degree. For this system, it will be evident if the crew does not know the individual machines that are controlled. MMC takes eight complex machines and turns them into one machine performing two well-known sequences – trip in and trip out. If something unforeseen happens, knowledge of the machine will help to solve the issue in a minimal amount of time. MMC has been implemented on two installations, and both are proving effective. This part will look at the theoretical top speeds that can be obtained with this rig design and what the system is delivering at the time this article was written. Recent updates have raised the tripping speeds in both directions. The system is approaching 38 stands/hr on TO and 41 stands/hr on TI. When this article was written, these new speeds had not been verified through continuous tripping by fully trained operators. It had only been tested by the actual crew, which was in training. Table 1: Initial-design trip-out times. Tripping times that have been observed during installation and tuning of the system are shown in Table 3. They are divided into groups for the periods when testing were done. It is important to note that when training like this is executed, the operators are not aiming for maximum speed but rather learning the sequences and how they work. Duration in the table below refers to the duration of the tripping sequence. A long duration will better show the average speed, indicating the extra time spent if the operator does not pay attention to whether the pipe is spun all the way in or out, etc. Table 2: Initial-design trip-in times. Installation of the MMC system is straightforward because there is no need for new wires from the local equipment room (LER) to the drill floor. The new MMC PLC is installed in LER and connected to the system, followed by upgrades to the operator interface. At this point, the MMC is ready to go. However, to achieve maximum performance, tuning is required. Because every rig is slightly different, fine-tuning can save typically between 2 to 15 seconds per stand. In the long run, even two seconds will amount to quite a few stands and is thus considered worthwhile. 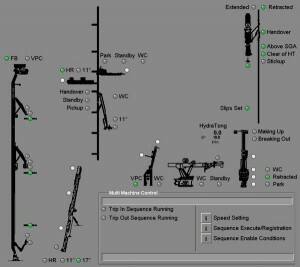 Fine-tuning will include finding the optimal waiting positions for each machine without triggering the anti-collision system (ACS). ACS is one of the more time-consuming unwanted events that can occur. If the ACS is triggered, several machines must be taken out of sequence to remedy the situation. Table 3: Tripping speeds during training (stands and ft/hour). With new systems like the one described here, there are always lessons to be learned. One that has been clearly observed is the importance of machine knowledge. If the operators do not know how each machine works, solving the problem by taking the machine in question out of sequence will take much more time than necessary. Another lessons learned is that there is value in discussing such systems with the crew that will work with it, making it as easy to use as possible. • Knowledge of how each machine in the MMC sequence works is still needed to achieve maximum efficiency. Acknowledgements: The authors would like to thank Kaj Kristensen, Allan McColl and Jesper Holck from Maersk Drilling for their contribution to the paper. We would also like to thank everyone else who has been involved and contributed to this paper and the related presentation. IADC/SPE 128700, “Fully Automated Pipehandling System on a 6th Generation Drilling Vessel,” was presented at the 2010 IADC/SPE Drilling Conference & Exhibition, New Orleans, La., 2-4 February 2010.